Reading Carrie Smith's wonderful essay "Illustration and ekphrasis: the working drafts of Ted Hughes's Cave Birds" in The Boundaries of the Literary Archive: Reclamation and Representation (edited by Carrie Smith and Lisa Stead, Ashgate, September 2013) got me thinking about Plath's own ekphrasis-experience with collaborating with a Baskin. The British Library holds a very important collection of Sylvia Plath letters in the Ted Hughes & Leonard Baskin collection (known as Hughes-Baskin Papers). The letters from Plath range in date from circa 1958-1962 and it was in reading these letters on a visit to the British Library last March that I learned (or, re-learned if I knew and forgot) about Plath's attempt to write a poem based on the work of Esther and Leonard Baskin. Of course there is Plath's poem "Sculptor" which was dedicated to Leonard Baskin, but that was not something Plath did in collaboration with him. 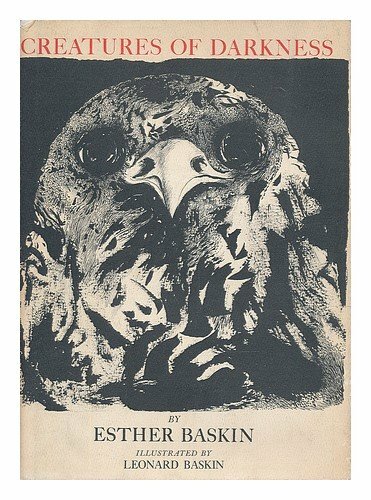 In late 1958 and early 1959, Plath was at work on a poem at the request of Esther Baskin, who in the process of building a book book that would become Creatures of Darkness (Boston: Little, Brown and Co., 1962 -- Plath's copy of this monograph is now owned by Smith College and bares her ownership address "23 Fitzroy Road, London NW1" (catalog record)). Plath spent some time reading up on night creatures at the Boston Public Library and the resulting poem was "Goatsucker". Plath wrote three letters to Baskin on this project, all from late 1958 or January 1959. In the first letter, which is undated, Plath writes to both Esther and Leonard Baskin about a stop in at the Boris Mirski Gallery to see some of Leonard Baskin's work, a one man show which exhibited sculptures, drawings and prints. On night creatures, Plath says she hopes to find out some of their nastier habits, that she did not observe any in Northampton, and that she will work on a poem on a bullfrog. She closes saying she hopes to stop in at Northampton in the spring, possibly to talk to creative classes. 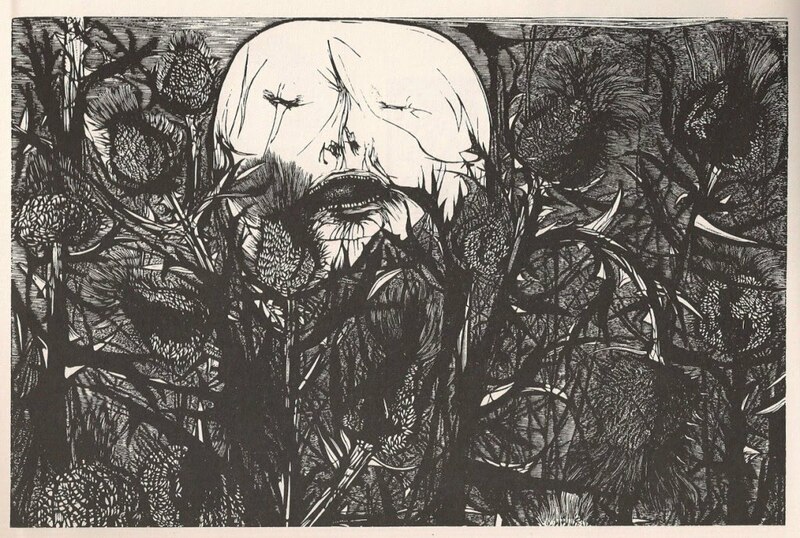 Plath expresses great admiration for Leonard Baskin's wood engraving "Death Among the Thistles" which was then on exhibit at the Boris Mirski Gallery, then located at 166 Newbury Street (map, also Ted Hughes writes about this exhibit. See his letter dated "[January 1959]" in Letters of Ted Hughes). A contemporary review of the exhibit from the Boston Globe said of Baskin's wood engravings that they are "superbly rendered in exquisite, sensitive line; bold, slashing, dramatic black and whites in which he cries out in an angry, violent way; also small misty renderings of bugs, insects and what have you" (Driscoll, 30 November 1958, p. 68). The exhibit seems to have opened sometime around 7 October 1958 and ran "through the 10th"; given lack of any context as to which 10th, it can be presumed that was the 10th of December. The second letter can be dated to before 21 January 1959. She addresses only Esther Baskin and tells her that she spent a rainy day in the library ensconced in research on goatsuckers and other night birds. She mentions Hughes' own poem on a bullfrog (called "Bullfrog"), and she asks for two weeks to write a poem on the goatsucker, a creature with which she was quite taken. She discusses several of Leonard Baskin's wood engravings on paper such as "The Seven Deadly Sins" and "Gluttony" (Baskin published a book called The Seven Deadly Sins in 1958 (The Gehenna Press; with poems by Anthony Hecht, also on the faculty of Smith College). Plath also discusses a New Year's 1958-1959 costume party they attended and that Hughes is in the process of drawing pikes. The third letter Plath actually dated (thank you). 21 January 1959! And again it is to Esther Baskin only. In this letter, Plath encloses her poem "Goatsucker" and tells her that all the details in the poem came directly out of books. (Would I ever love to know which books!) Plath talks in good detail about their acquiring a cat, called Sappho, who was on one side the grand-cat-daughter of Thomas Mann's cat. Plath again mentions Hughes drawing many pikes, discusses the dismal Boston winter weather (lamenting no snow), and asks if Esther Baskin knows about the Robert Graves poem "Outlaws", and then she typed the first four stanzas in the letter. She enclosed "Goatsucker" in this epistle. For whatever reason (clearly poor taste), Esther Baskin did not use the poem Plath wrote for her book, though, but she did take Ted Hughes' poem "Esther's Tomcat." Maybe it Plath had called it "Esther's Goatsucker" it might have been accepted? In addition to the three letters discussed above, the British Library holds three additional letters from Plath to Esther and/or Leonard Baskin. These are dated 28 April 1959; 26 April 1961; and 16 April 1962. Here is a brief synopsis of the letters, which all can be found in Add Ms 83684. Addressed to both Leonard and Esther Baskin, Plath's letter of 28 April 1959 expresses delight at having seen them the previous week (circa 17 April). Plath follows up on Esther Baskin's book, which had been submitted to the Atlantic Monthly Press, mentions that Hughes is at work on Meet My Folks, and about a red fox that was living under the State House in Boston. Plath asks Leonard Baskin if she can dedicate her poem "Sculptor" to him, the first time she has officially ever dedicated a poem to anyone, commenting that as "Esther's Tomcat" memorialized Esther Baskin, Plath was seeking to do the same thing with her "Sculptor". She ends the letter saying that she will see them before or after Yaddo. The last letter from 16 April 1962 is longer and addressed solely to Leonard Baskin. Plath sets the scene of Court Green writing about her large Elizabethan oak table, her acre of bobbing daffodils, the church, her newborn Nicholas Farrar Hughes, Frieda Hughes' adjusting to the new abode, and leaves space at the end for Hughes to write a note upon his return to Court Green. Hughes was absent, seeing a Baskin show in London at Erskine's (RWS Galleries / 26 Conduit Street, London W.1 (map). Hughes' London-jaunt was in part to gather material to write an introduction to the exhibition catalogue, which was published under the title Leonard Baskin: Woodcuts & wood-engravings). The visit Baskin made the year before did not go well and Plath expresses regret for the way she behaved, explaining that she was in the middle of writing a novel, that their flat was too small, and that now installed in Court Green things were far better and he would be most welcome and comfortable (Hughes wrote to Baskin about this as well, see letter dated "[August 1961]" in Letters of Ted Hughes). She mentions her Saxton grant to finish the novel and that the money from it greatly reduced all the stress of the house, the babies, etc. The British Library holds many other documents in the Hughes-Baskin collection. Many of them are originated by Plath's. In Add Ms 83687 one can find typescripts of the following works by Plath: "Sow", "The Earthenware Head", "Black Rook in Rainy Weather", "November Graveyard, Haworth", "Aftermath", "Snakecharmer", "Sculptor", "Hardcastle Crags", and "Green Rock Winthrop Bay", and an off-print of Plath's "Sculptor" in Grecourt Review, dedicated and presented to Leonard Baskin on 7 July 1959. This was given to him at the beginning of Plath and Hughes' cross-country US tour, which David Trinidad wrote about beautifully in "On the Road with Sylvia and Ted: Plath and Hughes's 1959 Trip Across America". All links accessed 25-26 October 2013. Post modified & updated: 12 December 2013. Leonard Baskin's ''Death among the Thistles'' is absolutely captivating! Plath had a good taste, obviously (contrary to Esther Baskin :-)). Thanks Sue! This is certainly a possibility. The Boston Public Library currently holds the 1964 edition, but that doesn't mean they didn't once have the 1940 edition. They certainly hold many of his other Life Histories books that would have been there when Plath was there.